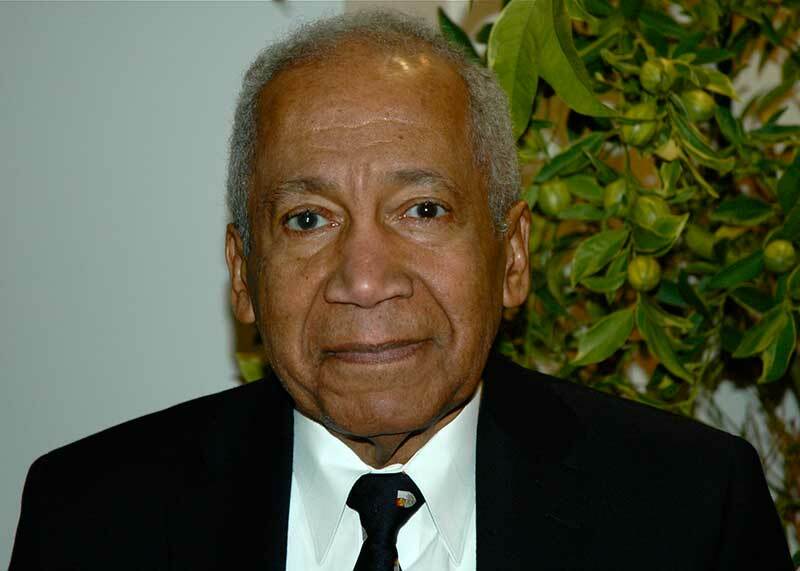 Keith Ellis (Jamaica 1935) is Professor Emeritus, Department of Spanish and Portuguese, University of Toronto, and Professor of Merit, the University of Havana. 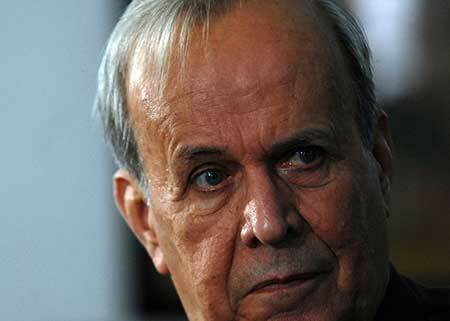 He taught Latin American poetry until his retirement, publishing many books and articles in this area. His own poetry has appeared in several journals in the Caribbean, North America and China. Among his awards are the Dulce María Loynaz International Prize (Cuba), the Andrés Bello Medal (Venezuela), Doctor honoris causa from the University of Havana and the Order of Distinction (CD) from the government of Jamaica. He is a Fellow of the Royal Society of Canada. Ricardo Alarcón de Quesada was a member of the leadership of the 26th of July Movement in the clandestine struggle against the Batista dictatorship; Vice-President and President, Federation of University Students, 1959–62; Director, United States Desk, Ministry of Foreign Affairs, 1962–65; Permanent Representative of Cuba to the United Nations, 1965–78 and 1990–92; Vice-Minister of Foreign Affairs, 1978–90; Minister of Foreign Affairs, 1992–93; Deputy and President, National Assembly of People’s Power, 1993–2013. Any open-minded discussion about the asymmetrical Cuba–U.S. relations should start with this highly readable, informative book. An expert on Cuba, Arnold August offers a revealing view of the conflict between Washington and Havana and the foreign policy of the United States vis-à-vis the island. August provides the reader with a bridge across time and nations to understand the changes that have led to the “normalization” of Cuba–U.S. relations and serves as a guide to the Trump future. Here at last for English-speaking readers is a full overview of U.S. relations with Cuba from Cuban points of view. The book is essential background for understanding whatever President Trump has in store. Arnold August is one of the foremost experts on Cuba and the 1959 Revolution, which continues to shake the world. In this new book, August puts forth a valuable, detailed account of U.S.–Cuba relations dating back to 1783 and continuing to the present time. August shows that this relationship has centred on the U.S.’s attempts, sometimes successfully, to dominate Cuba and exploit it as its own playground and, in the case of Guantánamo, as a maximum security prison. As he shows, the 1959 Revolution broke the U.S. hold over Cuba, and the U.S. has tried desperately, and many times violently, to regain its control over the island. Obama opened diplomatic ties with Cuba for the first time in 50 years. August explains what this opening means for both countries, and where he sees U.S.–Cuba relations heading after the death of Fidel Castro at age 90 and the rise of U.S. President Donald Trump. For those who want a fresh and reasoned perspective on Cuba and U.S. relations — and with it a perspective very different from that which we get from the mainstream Western media — this book is a must-read. In his third book, August highlights the many roadblocks on the way to normalization. Unlike many mainstream “cubanologists”, who are blind to imperial arrogance, he places the onus squarely on U.S. prejudices. Regime change remains the ultimate objective under a new disguise. A cultural war has been targeting the younger generations. New Plattists [those in favour of annexation to the U.S.] are showing up. August’s deft analysis, firmly grounded in a prolonged exposure to Cuban history and debates while mapping out the possible future developments, makes for an enlightening book. 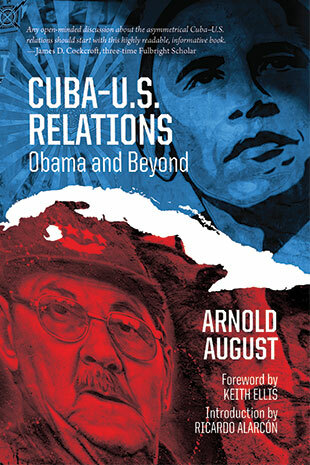 Arnold August’s new book on Cuba dispels the propaganda and myths perpetuated by both the U.S. corporate media and the Obama administration and provides valuable insights into what we might expect from a Trump government in the post-Fidel era. August lays bare the realities of Obama’s policies toward Cuba by methodically revealing how his administration’s engagement with the island constituted a shift in tactics while retaining Washington’s decades-long objective of achieving regime change to bring the socialist nation back into the U.S. sphere of influence. It also highlights our narrow definition of democracy by challenging the repeated assertions that Cuba is a dictatorship. This book is a must-read for understanding the constantly evolving imperialist strategies of the United States, not only in Cuba, but throughout the world in the 21st century. Arnold August’s bristling collection of interventions vigorously debunks U.S.-centric misrepresentations of Cuban society and of Obama’s new “regime change” strategy. It also engages critically with Cuban intellectuals and bloggers fighting in the “Cultural War”, challenging the Revolution’s cohesion since the 2014 “normalization” process began. In Cuba–U.S. 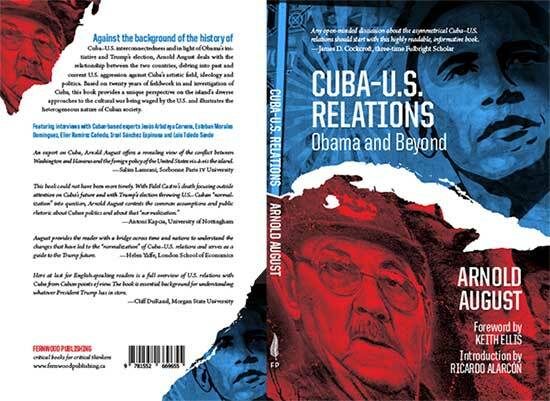 Relations: Obama and Beyond, Arnold August provides an incisive analysis of the process that led to the rapprochement between the United States and Cuba under the leadership of Raúl Castro and Barack Obama, as well as further developments since. The book is a timely and valuable source of clear analysis of Cuba–U.S. relations at the dawn of the Trump era, and an indispensable tome for activists and others interested in furthering normalized relations between Cuba and the U.S. and asserting Cuba’s right to self-determination and sovereignty over all its territory. Against the background of the history of Cuba–U.S. interconnectedness and in light of Obama’s initiative and Trump’s election, Arnold August deals with the relationship between the two countries, delving into past and current U.S. aggression against Cuba’s artistic field, ideology and politics. Based on twenty years of fieldwork in and investigation of Cuba, this book provides a unique perspective on the island’s diverse approaches to the cultural war being waged by the U.S. and illustrates the heterogeneous nature of Cuban society.